Boise. ID. When you drive or hike into this east central Idaho high country (Idaho’s highest mountains), you would expect to see pristine creeks. On the Salmon-Challis NF, however, one is usually disappointed. 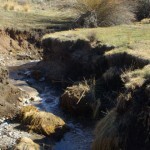 The creeks are sacrificed to appease local ranchers with tiny amounts of extra grass (in the short run). 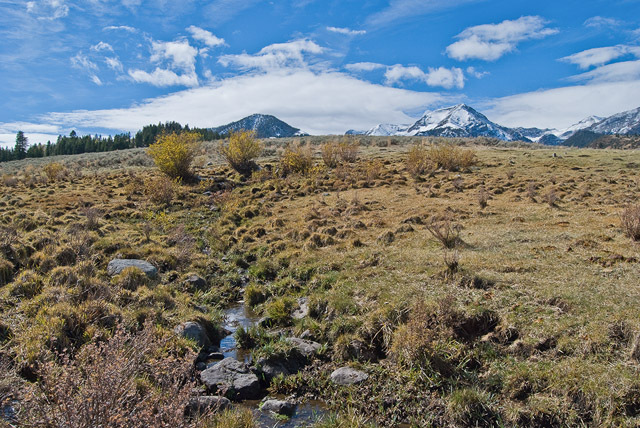 These cattle abused creeks high in the scenic Lost River Range are getting some legal love from the Western Watersheds Project and their law firm, Advocates for the West. On Wednesday, April 10th, Western Watersheds Project (WWP) filed a Complaint in Federal District court in Boise, Idaho challenging the Salmon-Challis National Forest, the US Fish and Wildlife Service and the Bureau of Land Management for violating a number of Federal Statutes by authorizing illegal livestock grazing in Idaho’s Little Lost River watershed. A small, isolated population of bull trout clings to existence in the Little Lost River watershed. Spectacular scenery of rugged mountain ranges and snow-covered peaks like Bell and Diamond Peaks in the Lemhi Range, and the magnificent Lost River Range, provide the backdrop for one of central Idaho’s most scenic landscapes. Federal agencies have been unwilling to tackle the livestock grazing impacts that are causing soil erosion, loss of perennial water flows, streambank trampling and loss of bull trout habitat. Instead, piecemeal projects have strung barbed wire back and forth across the stream. At lower elevations, the Idaho Falls BLM has turned a series of riparian exclosures built to remove cattle impacts to sensitive riparian zones into “pastures,” claiming that for some reason the cattle that graze inside the exclosures have no effect on the creeks. Even casual inspection shows that the exclosures have eroding cut-banks where past grazing damage has caused stream entrenchment and gullying. In the headwaters on the Forest Service Wet Creek and Mill Creek drainages, very small headwater streams and tributary springs and seeps are in very poor condition. In places in Wet Creek, the water stinks of livestock waste. If one wades across the stream, plumes of brown sediment muck cloud the water. Small aspen-lined spring drainages are dying altogether as livestock trampling causes headcuts that drain the waters above. In its required consultation that the USFWS accepted as legitimate, the Forest Service and BLM looked at only limited effects of grazing. They never considered the total “hoofprint” of cattle and other disturbances in these watersheds. So in order to better gauge grazing impacts, WWP sought to work cooperatively with the Forest to monitor grazing use. WWP supplied and built heavy large wire cages that provided a comparison between grazed and ungrazed areas. After one season, the Forest, possibly under the political thumb of the livestock industry did not like clear visual comparisons of impacts between protected and unprotected areas and ordered the cages removed. Read the complaint to the court. WWP vs. USFS and USFWS). For a place like Idaho where one imagines trout and salmon swimming freely, this is pretty disappointing. Why isn’t this administration able to get endangered animals on the Endangered list? Bull trout are already on the Endangered Species Act list. The US Forest Service isn’t doing enough to protect them here. I don’t think that this Administration in Washington really cares much about the issue. Frankly, I think they are awful and they only get my grudging support at times because the Republicans have fallen off the planet, so to speak. This area of the Salmon-Challis National Forest has always been badly managed. The local culture is hard to change and that affects the Forest Service district rangers. Records going back to the 1920s show the same families abusing the land. If that’s the district I think it is — and I’m sure it is, the ranger on that district and my wife were classmates at Humboldt State in the middle and late 80s. Ironically, my wife said that that now-ranger was by far the “greenest” student in the class. She apparently figured out pretty quickly which side her bread was buttered on and made a conscious decision to NOT do what she knows is right in order to get ahead in the agency. That is amazing, but speaks to the difficulty we face. The range con on this district 20 years ago told me it was the worst case of cattle overstocking he had ever seen . . . even worse than when he was in central Nevada. Probably won’t word this question (or thoughts 🙂 to everyone’s satisfaction but I’m curious to know…. what would happen to the minority of ranchers, who actually hold a majority of leases to public land grazing, if they suddenly found themselves without those options? I’ve got some huge ranches around me (acre wise) that push their cattle on to public lands every year so they can lay up hay for the winter. I also know these ranchers benefit (tax breaks, etc) to leave certain parts of their own property under developed, so to speak, even though they still run livestock on those areas. So, at what point does it become a wash where wildlife actually benefits? Because honestly? I get the feeling that most ranch/farm operations will only continue to exist til their heirs (and Elk probably knows more about this being in real estate) say “thank goodness” its over, finally, to that old way of life Mom & Dad (his Dad or her Dad) loved. I don’t think you are going to see much change in your area, those ranches around you are generations old and many of the kids plan to continue with them. I have met quite a few of them when I used to hunt in that area. I had permission to hunt a good many of them. Use to hunt SB? And when were you last around these parts? Nancy there is a lot changing that you will never see or hear about. I do know what is changing in the upper big hole river. Small steams are returning more directly to the river, fish ladders installed, spawning for grayling, fish barriers etc. I hunted down your way 2 years ago, I probably won’t come down that way until the stuff with the owners cutting off access because they are pissed at FWP is over. Mostly, I sat in camp around the campfire. It will be two years ago, this coming Sept.
You ask what would happen if ranches lost their public lands? In this area most would like to get rid of their public lands if they could untangle the checker board of land ownership. The general answer would be they would have to downsize the number of animals carried. Then it would be a question of if they could survive on that herd size. Each operation has fixed cost (cost that you would have no matter your size) plus variable cost ( cost for each individual animal) if the ranch can still pay the bills they stay in business. Easements are often done for inheritance reasons, easements lower the land value by restricting future use, usually development. Again you suggest wildlife and cattle can’t live on the same land which is untrue, it’s a question on management objectives. Should we remove all human influences in Montana and make it a park? Good question RB. As someone who’s probably witnessed the needless destruction of land, water and wildlife due to “human influences” I’d love to know your thoughts? I don’t have to go very far to see destruction from livestock to land and stream banks just on private property. And I don’t have to go much further from those private lands, to see the same kind of destruction, on public lands. What this thread is all about. In the part of central Idaho where this lawsuit is directed, there are not a lot of big ranches. More importantly, the ratio of deeded land owned by the grazing permittee to the amount of leased public land is low . . . say one acre to ten of public land. More typical in the West (I think) is about one acre to two of public land (or 1:1). This fact, if I am correct, makes the operation more of a subsidy thing than ranches elsewhere in the West. So the public should expect better practices of these livestock operators. It is possible that Alf would have an opinion on this ranch size question. It is sad that having a nice piece of property in a beautiful place isn’t incentive enough to take care of it. If you’re treating the property like garbage, i’d hate to see how the cattle themselves are being treated. Overstocking cattle shouldn’t just be considered as bad for the land, but also as animal cruelty. Custer Cty is 97% public land, so I think you are right regarding higher ratios of public land allotment acres/private acreage. Ours is about 15:1 (what we’re permitted for, not what we actually use in a given year). However, I think the truer measure of “subsidization” would be the productivity of such lands. Much of the land in Central Idaho is dry, cold, and infertile. In the rainshadow of the Lost Rivers, it takes lots of acres to grow enough grass for one cow. Much more than, say, allotments in most of western MT. I don’t necessarily agree that the level of subsidy should be connected to better practices. My feeling is that one should practice good range management regardless of the size of one’s permitted acreage. I guess I don’t follow you on why that would make someone less likely to pass the ranch on, or why such a disparity would create less incentive to “work the land”. Could you elaborate on that? Tom Page – Ralph will have his own take on it, but I took his meaning to be that these lands are so marginal, the economics so hand-to-mouth, that operators may always be looking for the EXIT sign. That they may not be thinking long term, so why not get while the gettin’s good? Keep as many cows out there as you possibly can now , because you’ll probably gone a decade from now anyway. Granted, a good many of the ranches in these marginal zones have been in the same hands for three or four generations. Short term thinking, however, can go on for generations. Each generation resignedly leaning into the yoke, asking themselves why the hell they don’t quit (answers will vary a great deal, but some of us stay stuck due to fear of the unknown. In today’s crazy world, though, I get it why someone would choose ranch life outside Mackay over suburban life in Boise or LA). The more straightforward answer is analogous to the housing bubble: if you actually hold title to less than 10 percent of your ranch’s resource base, you’re extremely vulnerable to getting shut down, as well as far more likely to walk away. It’s similar to people who took out zero-down, maybe even interest-only mortgages on homes. Not much skin in the game, really. Why put a lot of effort into improving something that isn’t yours? Just ride it out while you can, keep those low-maintenance grass-to-beef-conversion machines (cattle) out there in high numbers til something makes you stop. Or, as the property rights theorists love to say, no one ever washes a rental car. The example given in the hoover.org website you gave is premised on bison transmitting brucellosis to cattle (Ted Turner’s bison example), which I thought was never demonstrated in a natural setting. Am I wrong here? Without people agreeing that they tranmsit from bison to cattle, the whole example folds. I get the not washing a rental car example, and agree in principle with the tragedy of the commons issue, but are you suggesting no one other than a rancher that owns land can take care of the land? Nope, I am not endorsing that monomania about property rights. I think they tend to over-simplify complex issues — for example, that YNP’s brucellosis problem comes down to the bison (they conveniently don’t mention elk) being held in public trust. Really, just using that washing-a-rental-car conceit to illustrate. Instead, I’d say, if we can’t bring ourselves to effectively enforce the careful treatment of grazing allotments, then no one should use them. If Hertz decided that they were going to encourage customers wash rental cars, they could make that happen. And I imagine that they’ve probably got a “blacklist” already — customers who don’t get to rent cars anymore because they mistreated them so badly. There are plenty of options besides privatization for getting the outcomes we desire. I have “blacklisted” a few ag land renters in recent years. We clearly had very different ideas about concepts like “fix the fence,” or how much grass should be left (they thought zero; bare dirt). The renters’ pinheaded perspective was they should extract as much as value every year as they could. I sort of get it, but I don’t get why they wouldn’t want to do a good job so we’d be interested in having them back in the future, as well as have a good reference for leasing other places. Clearly, the solution here is not to just give the land to the renter, but to impose consequences on them (they don’t get to rent the place anymore, and I don’t give them glowing references, either). Leaving aside the complications of political control of the land management agencies, I see no reason why BLM or USFS couldn’t or shouldn’t impose consequences on renters who abuse the land. I agree wholeheartedly. Thanks for the explanation. Thanks! I couldn’t have said it better. In addition, none of the children (usually) think or want to ranch from such a small base of deeded land, especially when it is marginal, or has marginal federal grazing allotments attached to it. They will usually try to sell it off as recreation property. In fact many existing ranchers in the area get by, by selling 1, 2, 5 or 10 acres of their base for recreation second homes sites (or full time homes). Tom Page, you know the East Fork of the Salmon country. That is just what has slowly happened there. Thanks for the explanation – very helpful. The only thing I would say is that just because the acreage is 10:1 (or more) doesn’t necessarily mean that the resource allocation is the same. Private lands usually have better soil and irrigation, thus they are far more productive than Central Idaho rangelands. In other words, these lands are not suitable for grazing by non-native cattle that evolved in a humid climate and spend all of their time shitting in western streams. Whether those lands were to be grazed by bison or cows, the acres/animal would still be very high…species is a separate issue. Nancy it’s not who I want believe because I know it’s happening for a fact. The company I work for is working with Ranchers and all agencies to return water and restore grayling and riperain. Oh and I forgot we are also big on building water fowl habitat. It’s a crazy world when you don’t know what’s happening right in your back yard. Robert R – its not that I don’t believe you’re making efforts, I’m just not seeing it in MY backyard. Willows being riped out and a local stream down to the rocks in some places come summer, to satisfy water rights/ and the irrigation of hay fields. Nancy I want to think about some physics here. First water is being taken out for irrigation and I agree it makes water levels low and you combined that with less than average snow pack and drought and things can get bad in late summer. Second all that flood irrigation is actually storing water in the aquifer to help supply winter water levels. Third this stored water seeping through the underground aquifer back into the river can cool the river as much as 10 degrees. I know this for a fact because I took water temps in the 1988 drought. As much as everyone likes sprinkler irrigation for saving and using less water over flood irrigation there is huge trade off. The water that was once put into the aquifer from flood irrigation kept some cottonwood stands alive wich are dying out because flood irrigation is a thing of the past. This loss of trees and some cases willows is part of the riperain. I’ve studied this river for fourty years and seen the changes and its far from over. We’ve spent a lot of time and money on bull trout around my area. What time do the bulls spawn in this area? What is their average size? Where do they spend the rest of the year? It would be a good time to explain why these small streams are important to bull trout, just a few points that were left out in the article. Read the complaint at the bottom of the article and your questions should be answered. That is why I put a link to the complaint — for additional information — the argument intended to convince a judge. I suspect that many of the permitees in that area turn out far more cows than they have permits for. The USFS and BLM have always been negligent in actually counting livestock on the range and the ranchers have learned to take advantage of that situation. While I support getting the cows out of the area, using Bull Trout as a reason is iffy. The Bull Trout in the Little Lost drainage came from the ditch that diverts water from the head waters of the Pahsimeroi River to Summit Reservoir that supplies water to the Upper Little Lost River area. Bull Trout are not native to the Little Lost River. I have hunted, fished and photographed in the Little Lost since 1955. I attended high school with many of the older ranchers that live in the Little Lost River Valley. Other than sculpins and whitefish, there were no fish in the Big or Little Lost Rivers until they were planted there by early settlers and IDFG. Thanks for making the point about the proper vehicle for achieving better range management in this case, Larry. I agree completely. As a user on the creek (but not the ditch) that you note as the conduit for BT to move into the Little Lost, I’m continually hopeful that the ranch in question will pass to someone who would be interested in returning those flows to the Pahsimeroi Basin to work on the restoration and reconnection of Big Gulch Creek. Pass Creek is pretty thrashed, regardless. I don’t know about your suspicions regarding turnout numbers. I watch that pretty carefully on our allotments to the north and our neighboring allotments, and I don’t see that happening. Trespass and other poor management practices, yes, but most permittees are staying within their permitted seasons and numbers. That is good news if there has been a change in recent years. Ive seen the same treatment of seeps and springs in the upper pahsemeroi valley near carlson lake. It’s a shame because overlooking the valley it appears quite nice but upon closer inspection most water features are trampled and eroding.